Click the button below to add the 2.5m x 1m Custom Printed Fabric Backdrop to your wish list. This 2.5m x 1m backdrop will be suitable for small gigs and events. Printed using the latest digital dye-sublimation technology our backdrops feature deep, vivid colours, and incredible image quality. We can print anything on your backdrop, from a simple logo through to a full colour photographic image. The only limit is your imagination! This backdrop is printed on fire-retardant polyester material and comes with the required certification. This is our most popular backdrop material. 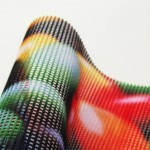 Thanks to the tight weave of the fabric we can achieve dense, vivid colours and deep blacks. This mid-weight polyester based material ticks all the boxes - easy to store and transport, tough, hardwearing, and looks fabulous. 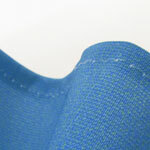 If you're after a little more texture than our smooth Fabric material Canvas may just be your answer. 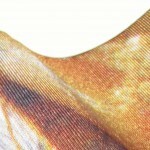 The more natural, textile feel means this polyester based Canvas material oozes quality. A tiny amount of the colour density and detail is lost in the looser weave, but what's lost there is gained in the classy, super tough finish. Be careful not to overshadow your band with our super showy gloss Satin material. Light it properly and the ripples and folds give a truly silky luxurious texture. Just make sure it fits your rock 'n roll image though! Due to the satin finish darker colours will lighten - this material works best with bright reds, greens and blues. Why have boring black amp cabs when you can express yourself in print? Our acoustic scrim looks great and doesn't mute your sound. Whether you're covering a 15ft speaker stack or a 1X12" guitar cab this is the material for the job. Works great on our Jackstands as well, for freestanding amp covers. At bandbanners we're flexible about our finishing. Just specify your preferred option for each banner edge, and we'll fabricate it. Any backdrops 5m x 3m or above will be fitted with fabric ties at the top as standard. Tough machine stitched hems give your backdrop superhero strength. 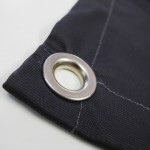 Eyelets are the standard finishing option for most backdrops. Giving you the ability to rope, hook, cable tie or bungee cord to your rigging, it's the most versatile finishing option. Fabric ties are really useful for larger backdrops. Stitched right into the cloth of your backdrop, they can handle more tension than eyelets, and negate the need for accessories such as rope or cable ties. We'll even try and match the colour of your fabric ties to the backdrop. Pockets are useful if you're combining your banner with a stand system with a crossbar. We'll stitch a 90mm pocket as standard, or 70mm for use with a JackStand. If you're hanging your backdrop and need to tension it a pocket along the bottom edge is a godsend - simply insert a dowel and Bob is immediately your mother's brother. Velcro is just so useful - without it we'd all be floating around in space. If you're aiming to attach your backdrop to something a bit more unusual (an exhibition stand, for example) this is a great way to guarantee a result. 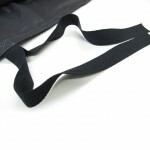 Our super strong velcro won't let you down, and we'll supply you with the other side in an adhesive backed strip. 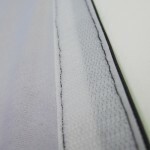 Velcro is also great for attaching scrim banners to your guitar cabs. Files should be supplied in pdf, eps, ai, psd, tif, or jpg format. These are in order of preference. Artwork should be supplied at actual size. The larger you go the harder this is going to be, so you can start reducing resolution. Artwork is best supplied as a vector. If you are supplying a bitmap file the ideal resolution is 150dpi. If you are designing a larger backdrop this can be reduced as the size increases. Files should always be supplied in CMYK colour mode. Fabric is sympathetic to image quality, and backdrops are usually viewed from a distance. Our print quality is superb, but don't lose too much sleep if you can't achieve the file size you were hoping for. In vector always convert fonts to curves. For high-res stock imagery at reasonable prices try fotolia.co.uk. Always shoot for the XXL or V file sizes. Standard turnaround on this backdrop is 5-7 working days. We can print banners to any size, and add all kinds of bespoke finishing. Email us regarding a custom order and we'll price it.